Chores, chores, and more chores. So this is our new set up. It's ok. It will work, but I don't love it. I really want to love it, especially considering how much time I spent finding free clipart, printing, cutting, and laminating all those little puppies. But it just ended up looking messy to me. 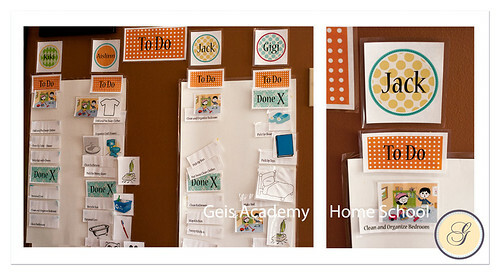 We have tried lots of different chore chart methods and so far I have yet to find one that I like. This is the closest and is probably my next step. In the mean time, we'll use what we have. I can tell you that my kids love it! And that is the most important part. They love the bright colors and the personalization. The little ones love the pictures, too. Everything is laminated and I used ticky tack stuff to stick it to the laminated poster board. If we end up using this, I will get the velcro glue dots and use those. I wanted everything to be modular so the kids could move it around, design there charts, and move things to the DONE section as they complete them. Then we listed out everything that was not labeled "Mommy/Daddy chore" and the kids divided those up amongst themselves (with our help). My 5 year old chose sweeping and mopping the kitchen. Wow! And you know he has done a pretty nice job of doing that for the past few months. Of course, it's 5 year old mopping, but when done every day it still works out pretty well. So that's how we set up chore lists for our family. The 8 year old chose: Organizing the craft drawer, cleaning her bathroom, washing the food/water bowls and feeding the pets, Recycle Runs, cleaning up under the dining room table, and then she has personal chores. All chores are done daily. Even the bathrooms. When done daily it goes very fast. It takes the 5 year old about 2-3 minutes to clean his bathroom. "Cleaning the bathroom" is known around here as a Swish and Swipe - a borrowed term from the flylady? organize whatever is on the counter. Our children don't get paid for chores. At least not their own chores. I'm happy to pay them to do MY chores, though. I sat down with my oldest 2 and we negotiated out prices for Mommy's chores, e.g. folding and putting away my laundry or vacuuming the master bedroom. Surprisingly, they only take me up on that option occasionally. Learning about money is a whole other deal, though. And with all that said, I bet you think my house is clean. LOL Far from it. That's why we have chore charts to help us out. I use a Motivated Moms calendar for my own chores. I need all the help I can get to stay on top of all this while homeschooling, learning photography, and trying to keep up with my kids busy lives. Wow. I love this post. It really makes me feel like my ideas aren't crazy - if you can do it - so can I. Thank you! This worked/works great for us. In the middle of a move, I packed it in an unknown box and only have half the system. I can't wait to find it!